The court will be home to some of the top players in the world this summer. WASHINGTON — With the weather warming up, we know we can expect people to enjoy the sun with friends at the long list of D.C. rooftop bars. Between the views and the breeze, rooftops can be the perfect the place to play a game of tennis. 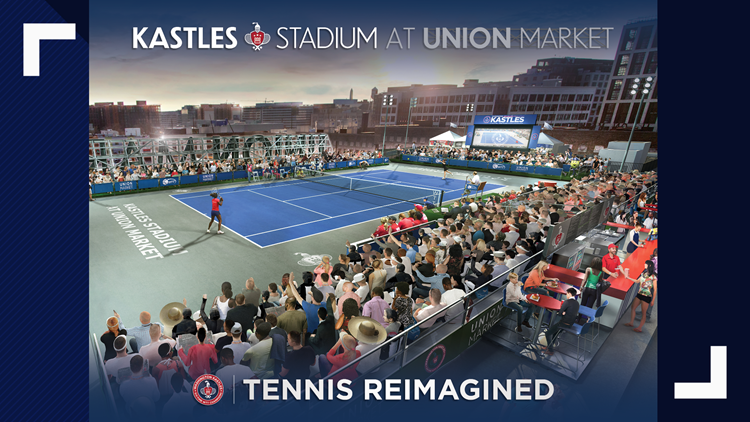 That's why this summer the Washington Kastles will be finding a new home on top of Union Market in Northeast, D.C. The Kastles Stadium aims to create an incredible fan experience by merging tennis with a rooftop stadium. “As a Washingtonian who loves this city, I am dedicated to bringing our community together and showcasing D.C. as a world-class destination through the power of sports,” said team owner Mark Ein. The court will be home to some of the top players in the world this summer, including Venus Williams, Nick Kyrgios, and Maryland native Frances Tiafoe. “The new Kastles Stadium will place fans in the center of the action making them a part of the Union Market community while showcasing the beauty of the D.C. skyline, making it one of the most spectacular and iconic sporting venues the city has ever seen,” said Ein.